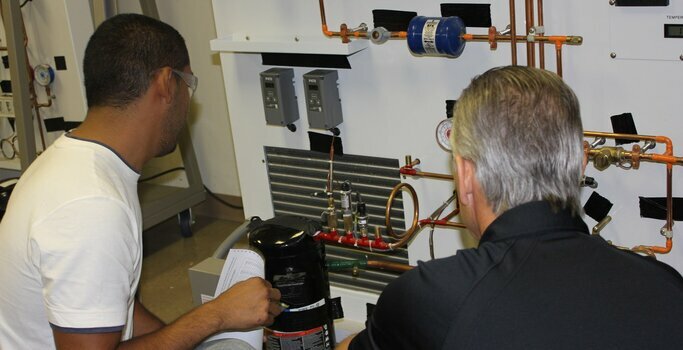 ARPEC (Air Conditioning, Refrigeration, and Pipefitting Education Center) offers apprenticeship training programs that will give you an opportunity to further your education and earn income at the same time. We aim to help individuals who want to advance their education but don’t have the financial means to do so. For this reason, the programs we offer are completely tuition-free. We understand that finding a job without tertiary education can be challenging. This is why our programs are designed in a way that you get to earn an hourly wage while studying. We are committed to helping you succeed. If you want to start a new career or are considering to transition into a new line of work, we can give you the guidance you need. ARPEC traces its roots to more than six decades ago in Florida. On October 11, 1949, our first education center was registered with the state as an apprenticeship program provider. Since then, we have established a reputation as one of the most esteemed vocational institutions in Florida. You may not have a college diploma, but that doesn’t mean you won’t be able to have a rewarding career. In a fast-changing economy and industry, one of the keys to success is the ability to adapt and learn new skills. Our mission is to help individuals soar to greater heights through our air conditioning, refrigeration, and pipefitting program. We have carefully planned our curriculum to give our vocationally inclined students the knowledge and skills they need to land a promising career. ARPEC in Miami, FL offers an extensive classroom curriculum matched with on-the-job training (OJT) so students can earn, learn, and succeed in a life-long career. With our air conditioning, refrigeration, and pipefitting program, you can take your education to another level while generating income. By enrolling in our program, you’ll have the chance to earn a certification without having to pay tuition fees. You’ll also be paid at an hourly rate while doing your OJT, with health, welfare, and pension benefits to be added as you advance in your studies. Take your first step toward a fulfilling career and bright future. Contact us today to learn more about our program, requirements, and application process. If you like the challenge of learning new skills and are good with your hands, the ARPEC program could be perfect for you! Discover real stories about how ARPEC has changed their lives for the better.